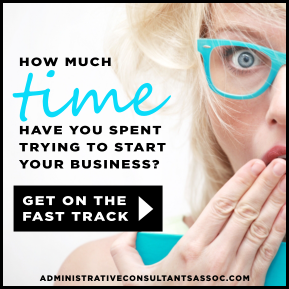 Everything you need to know to get your business relationship with an Administrative Consultant off to the best start! Following are the key ingredients you must bring to the table to ensure you experience the most fruitful and rewarding benefits of working with an Administrative Consultant. Understand the nature of the relationship. The relationship you have with an Administrative Consultant is similar to that which you have with an attorney or accountant or other independent professional. She is not your employee or "hired help." She is an administrative expert, collaborative partner and trusted advisor. Respect her opinions and concerns. Be open to her input and advice. Your best interests and success are her priority. Collaborative partnership. Relationships are a two-way street; your participation is required. In order for it to work—indeed, for the magic to happen—and for you to get the very best experience and outcomes from the work you do together, you, as the client, are an integral part of the equation. If you are absent from the relationship, it won't work, and you will end up dissatisfied. Comfortable with technology. Just like your attorney or accountant, an Administrative Consultant works from her own offices. It's quite possible you may never even meet in person. Meetings and consultations are typically held by phone or video chat (e.g., Skype) and email is the primary form of regular communication. You don't need to be a whiz, but you do need to be comfortable with computers, modern online technology, and communicating by email in order to work with an Administrative Consultant. Be present and timely. One of the most important relationships you have in your business is with your Administrative Consultant. The administrative engine she is determined to help you with is critical to your business's success and smooth, efficient operations. In order for her to accomplish those objectives, it's vital that you answer questions and provide requested information and materials in a timely manner so that it doesn't hold up your business and objectives or hers. Communication is key. This is especially important in this kind of tech-driven, remote working relationship where we primarily communicate by email. Like you, an Administrative Consultant is not a mind reader. We can get really good at anticipating your needs, tastes and preferences the longer we work together; still, we can't guess or make assumptions. It is better to err on the side of over-communication and be forthcoming with details and expectations. Your Administrative Consultant may have further clarifying questions to make sure everything is understood. Make meetings a priority. Do everything in your power to keep your appointments and show up prepared. If you have to cancel, do so with appropriate (not last minute) notice (your Administrative Consultant can let you know of her specific policies regarding cancellations). Mutual respect of each others' time is a necessity. No dumping. If you disappear for long periods of time and then suddenly show up with a flurry of work requests that you need done "yesterday"... well, that just isn't going to work. An Administrative Consultant has other clients to serve whose needs are as important as yours. Every Administrative Consultant has her own policies and protocols. To work together successfully, you will need to plan ahead, give plenty of lead time (as specified by your Administrative Consultant) and follow her procedures for submitting requests so that they can be managed effectively and accomplished in a timely manner to the highest standards. Practice the Golden Rule. Administrative Consultants expect to be treated with the same professional civility and respect with which you expect to be treated. We appreciate "please" and "thank you" as much as you. Clients who are unable to extend common courtesy and mutual respect are not a good fit and will be let go with haste. Maintain professionalism. Difficulties, dissatisfaction, conflicts and misunderstanding can arise in any relationship. Your Administrative Consultant is always interested in your constructive feedback and being given the opportunity to improve or make things right. When communicating upset or complaints, be sure to keep things professional, not personal. Continue to treat and speak to each other respectfully and humanely. This will go a long way in facilitating communication, being heard and finding resolution. Pay on time without any hassles. Respect cannot exist in the relationship where there is chronic late or nonpayment. You can expect one (or all) of these things to happen when that is the case: a) All work will cease until your account is paid in full; b) you will be required to pay in full up front for all work in the future; and c) you may be let go as a client. Own your business. An Administrative Consultant cannot care more about your business than you do. She is not responsible for ensuring you make money; that's your role. She wants to help and support you in achieving your goals and dreams, and she can if given the opportunity. However, the success or failure of your business is always your responsibility. Vacations and closures. It's important to understand that an Administrative Consultant is not a temp or substitute employee and, thus, does not provide that level of administrative support on a daily basis. What we provide is strategic support in specifically defined support areas. Just as your attorney or accountant (or any business, for that matter) is closed on occasion for holidays, vacations, emergencies or other reasons, so, too, will your Administrative Consultant's business. Your Administrative Consultant can advise you of her specific policies around notification so that you can plan accordingly. Your business should still be able to run without support during these times. If you are so dependent upon support that you are unable to take care of things yourself during these intermissions and your entire business comes to a screeching halt without us, what you really need is an employee, not an Administrative Consultant. Proper expectations. Rome wasn't built in a day. Neither will all your administrative needs, burdens and challenges be solved overnight. It's important to remember that this will be a process. The longer you work together, the more improvements, ease, positive change, and results you'll see in your business. Be generous and forthcoming with your praise, feedback and referrals. An Administrative Consultant is a business owner who takes pride and joy in her work and helping clients like you succeed. She's also human and appreciates recognition, a good word, and a pat on the back for a job well done (not to mention your referrals and recommendations). She may also ask for your formal feedback at specific intervals throughout the year. This is for your benefit as well as hers and gives you an opportunity to let her know how she's doing, voice any concerns and offer suggestions on how she can better serve you.